The CKT1175-50 is a high-voltage wiring analysis system that features a switching matrix that can be distributed around the workshop or in and around the assembly to be tested. This system is expandable in 100 or 150 test point increments to 96,000 test points, and is available with a variety of adapter cable interface connectors, with the standard being the CKT MAC interface system. The switching matrix is available in a variety of modular packaging configurations designed to conform to virtually any testing requirement. This modularity allows the switching matrix to be moved very close, or even integrated into, the assembly to be tested, thereby eliminating the requirement for long, unwieldy and cumbersome adapter cables. This means that the cost associated with manufacturing, storing and connecting the adapter cables will be dramatically decreased. The switching units contain no AC mains voltages, power supplies or fans. This design has enabled the CKT1175-50 to be certified to MIL-STD-810, assurance when testing pre-fueled aircraft. Line Replaceable Unit (LRU) switching units. With this wide range of available switching units, and the ability to mix these units randomly, a test system can be configured that will be optimally applicable to the assembly to be tested. Suitcase switching units are available with 1,000, 1,200 and 1,500 test points, and can be supplied with a variety of interface connections. They will support test voltages to 1,500 VAC RMS, test currents to 5 amperes, and are packaged in compact, rugged enclosures. For stability the suitcases interlock when stacked and are provided with front/rear covers when not in use. Suitcases are also available with external energization relays, and auxiliary relay outputs for random access 4-wire resistance measurements and databus phase testing. The CKT1175-50 switching can be integrated directly into ARINC Line Replaceable Unit (LRU) form factor boxes. These switching units are inserted into corresponding positions in aircraft electronics racks or distribution panels, thereby eliminating the requirement for adapter cables. All ARINC 404 and 600 form factors are supported, with the number of installed switching test points dependent upon the number of ARINC connector CKT Offices. When required, external energization relays can be provided. Mobile cabinets can be utilized when a larger number of test points are required within a concentrated area. An example is the bulkhead disconnect area of an aircraft section. The CKT1175-50 switching cabinets are available with up to 6,000 test points and in a number of different packaging configurations. A variety of interface connectors are available. Each of these cabinets are fitted with high-quality castors and an easy-grip handle bar for easy mobility; brakes are provided to hold the cabinets in place once positioned. All CKT1175-50 switching units are interconnected via a single, small-diameter daisy-chain cable which carries DC power, digital control signals and analog signals from the control console. A robust, transformer-coupled data bus (modeled after the MIL-STD-1553 bus) is used to maintain digital signal integrity in industrial environments where usually significant levels of electrical interference exist. For maximum hook-up flexibility the daisy-chain cables can connect the switching units in virtually any combination of star and in-line connection. The maximum length of a daisy-chain cable is 500 feet (150 meters). For maximum test productivity adapter cables can be connected at any test system connector when using the optional CKT Test Adapter ID System. 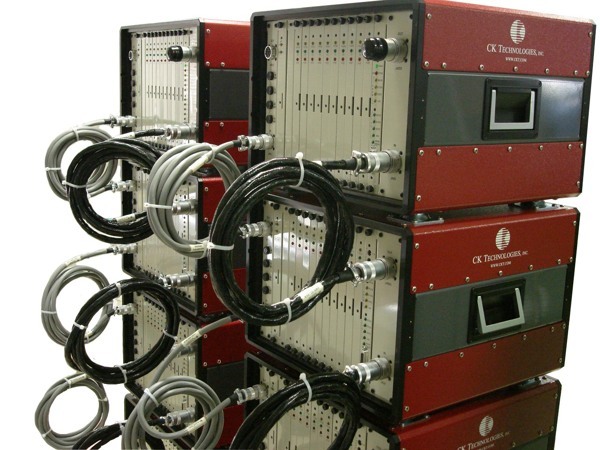 CKT developed software, in conjunction with embedded ID technology, which automatically understands where each adapter cable is connected at the test system interface and reorders the test program accordingly. This is a process that is completely transparent to the test operator, who will always see the original test program addressing during run time and when error data is output. This capability, particularly when used in conjunction with CKT’s adapter cable management system, will reduce adapter cable hook-up time to an absolute minimum, reducing test costs to levels not possible with conventional hook-up methodologies. As an example, one CKT customer is now testing 25% more aircraft assemblies with a single CKT1175-50 system than were previously tested with two competitors systems of the same size as the CKT system. The operator interface is available in a number of languages: English, German, Italian, French, Spanish and Chinese.